To use VST instruments and effects with DarkWave Studio you will need to tell the program where to find the DLL files on your computer. When DarkWave Studio is installed it creates the folders '\Program Files (x86)\ExperimentalScene\DarkWave Studio\x86\VST' and '\Program Files (x86)\ExperimentalScene\DarkWave Studio\x64\VST' in which you can place VST DLLs, 32-bit and 64-bit ones respectively. If you have VST DLLs installed elsewhere on your computer you can get DarkWave Studio to look in those folders by adding them in the VST Paths option dialog. 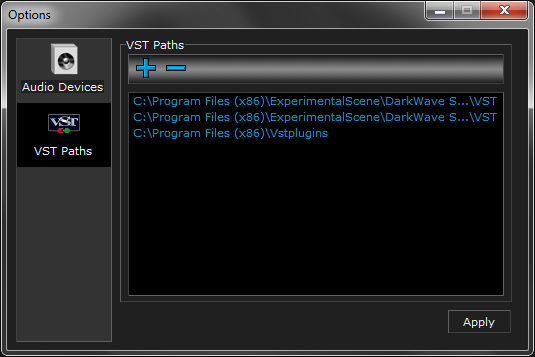 A typical location is '\Program Files (x86)\Vstplugins\' When you modify the VST Paths they will be scanned next time you start DarkWave Studio. If the program crashes while trying to load the VSTs due to a compatibility you can go to the Windows Start Menu->DarkWave Studio->Clear Options to stop DarkWave Studio loading VSTs from the paths you have added. If you are having trouble with some VSTs you may like to copy one at a time to the VST folder for DarkWave Studio (either the 32-bit for most VSTs or 64-bit for VSTs specially compiled for a 64-bit host) and see what works and what doesn't.